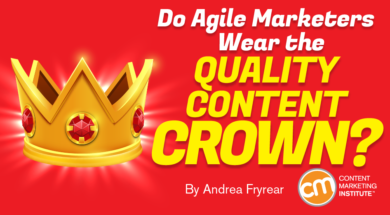 Do Agile Marketers Wear the Quality Content Crown? But how do we make it happen? In an interesting (and somewhat counterintuitive) twist, it turns out Agile marketing teams may have a good answer because they are more likely to prioritize quality than their traditional or ad-hoc process counterparts, according to results from AgileSherpas’ recent survey of marketing teams. Choose, apply, and consistently improve one or more Agile methodology. Kanban (a pull-based system that uses work-in-progress limits) or Scrum (the classic Agile process based around sprints) are the most common, but there’s no need to feel locked into one or the other. Most marketers end up using a hybrid approach, which is great, but they need to understand what’s available before building their custom methodology. Change their mindset. Rather than making a huge plan and sticking to it no matter what, Agile teams create short-term plans, execute them, and then adapt based on what happened. No more big-bang campaigns that use a quarter’s budget; Agile teams experiment and iterate continuously. Empower teams and enhance collaboration. Leadership can still determine what needs to be done, but an Agile team gets to decide most of how it happens. Empower the teams to do that, and make sure they can work together to get it done. No single practice transforms a team from agile to Agile, but these three big changes manifest themselves in different ways of working. Things like daily stand-up meetings, visualized workflow, and limits on how much can be in progress are the hallmarks of good Agile marketing teams. Traditional: We plan our work in advance using a lot of detail and try to stick as closely as possible to that plan. Agile: We use at least some parts of an Agile marketing approach to manage our work, such as daily stand-ups, a backlog, sprints, Kanban board, etc. We have plans, but they’re flexible and change often. Ad hoc: We don’t make long-term plans. We work on what seems right from day to day and don’t have a well-defined process for managing incoming work. Only 44% of ad hoc marketing teams say producing higher quality work is a priority. Traditional marketing teams are about the same, with 46% prioritizing quality. 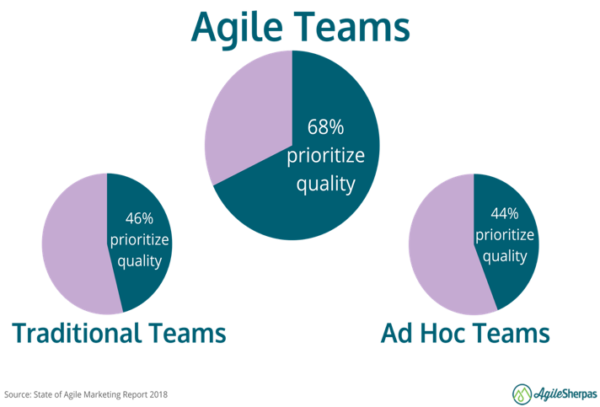 Agile marketing teams, however, are more likely to report a focus on quality. Sixty-eight percent of them said quality was a top priority in 2018. Agile teams don’t just report prioritizing quality marketing. They’re producing it. Yes, almost half of Agile marketers say they enjoy a higher quality of work. The connection between agility and quality is no accident; Agile methodologies were designed to help knowledge workers simply do better work. Originally this meant software developers writing code that worked and had fewer bugs, but the same principles help content teams create amazing experiences. Regardless of what methodology a team uses, Agile focuses on two things that make quality the standard, no matter what the team is producing: short periods of focused work and protection from external interruption. Let’s look at these one by one and explore how you can start making them happen on your own content team. Notice how each phase is dramatically shortened in the iterative version. This means a content marketer on that Agile team can really focus on completing a phase before moving to something else. In the “waterfall” content creation process, each phase is longer, allowing far more opportunity for an emergency (the real kind or the one created by a frantic colleague) to derail team members’ work. They have to stop, put out the fire, and then try to get back to whatever they were doing. This practice, known as context switching, destroys productivity and makes quality take a back seat to deadlines. Once a piece of MVC is in the world, see how it performs. If it does well, expand it. If not, abandon the idea and try something new. Either way, you’ve learned something fast and gotten closer to delivering the kind of content your audience really wants. This mindset adjustment is a great way to start thinking more like an Agile team. The second way Agile teams keep quality at the forefront is by eliminating external interruptions. Sprints – short time boxes of about two weeks – are one of the most popular ways of doing this. At the beginning of a sprint, the Agile team commits to completing a certain amount of work in the next two weeks. It lists the committed work in a sprint backlog, and any work not on that list is off limits. If someone outside the team makes a work request during the sprint, the team member politely declines and puts it on the list to be considered for the next sprint. Any delays should be short since a sprint only lasts two weeks, so it’s more like telling people, “not right now,” instead of giving them an outright no. As you might imagine, this description represents an ideal world, and the realities tend to be messier. But if the team is empowered to focus on its sprint and has leadership committed to the process to deliver quality content every two weeks, Agile teams can produce audience-delighting content at a remarkable pace. Agile is usually associated with speed, but being fast isn’t the only reason to embrace this approach. By keeping content marketing teams focused and protected inside an Agile system, you can create a system designed to consistently provide the quality that audiences crave. Grow your Agile skills in less than a few days. Learn firsthand from Andrea Fryrear and others at Intelligent Content Conference March 20-22 in Las Vegas. Register today using code BLOG100 to save $100.